center verso in graphite: [?] 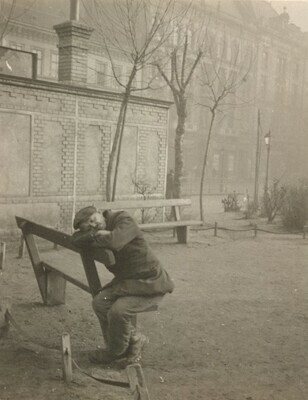 / 1918.jan.5. André Kertész, National Gallery of Art, Washington; Los Angeles County Museum of Art, Los Angeles; International Center of Photography, New York, 2005, no. 11. In the Face of History: European Photographers in the 20th Century, Barbican Art Gallery, London, 2006 - 2007, unnumbered catalogue. In the Face of History: European Photographers in the 20th Century. Exh. cat., Barbican Art Gallery, London. London: Black Dog: Barbican Art Gallery, 2006.